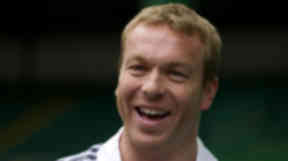 Sir Chris Hoy had a lucky escape after crashing his racing car at more than 120mph. The Olympic cycling champion was driving a Caterham Seven on the Silverstone circuit, near Northamptonshire, when the smash took place. Footage shows the Edinburgh-born athlete's super lightweight sports car career off the track after his pedal locked causing the vehicle to speed up. 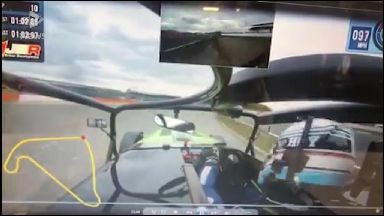 Sir Chris posted footage of his ordeal on Instagram which was filmed by the car's onboard camera. He wrote: "When the throttle pedal sticks fully open going into the fastest corner on the track... #allfine #codebrown. "Thought I'd locked up so came off the brake only to feel the car accelerate." He added: "Scared the bejeezus out of me though when the brakes did nothing to slow it down. "My wee brain rattled around like a pea in a whistle." The 43-year-old added: "All ok though, scary experience to feel the car keep pushing on towards the wall." Hoy's fans commented on the nail-biting footage with many thankful the sportsman escaped the crash uninjured. One wrote: "Scary. Glad the gravel slowed you down enough to be safe." Another added: "Good out come Chris! Stay safe!" Sir Chris announced his retirement from competitive cycling in 2013 before forming a motorsport career in 2014.